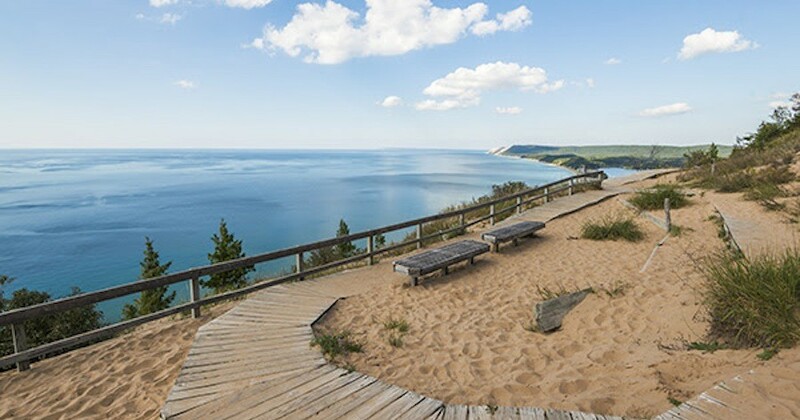 A photo of the Empire Bluff lookout along the Sleeping Bear Dunes National Lakeshore was the third most popular photograph in a global social media initiative held Sunday, September 27 to mark World Tourism Day. The photo was taken by Traverse City photographer Tony Demin. The photo was submitted by Traverse City Tourism through Pure Michigan, the state’s tourism brand, as part of a worldwide “Instagram Relay” organized by helloworld, an Australian travel organization. More than 75 Instagram “influencers” in 60 countries participated in the event, posting thousands of images of landscapes, cities, people and places around the world – all taken on the same day – using the #helloworldRELAY hashtag. World Tourism Day is an annual event created by the United Nations to raise awareness about the beneficial impact tourism has in bringing people together. On Sunday, as the sun rose at various destinations across the world — starting at sunrise in Samoa, the westernmost point of the earth and traveling across the world until it finished at sunset in the Cook Islands 36 hours later – Instagrammers were snapping and posting pictures.